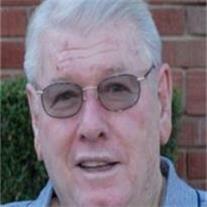 Darel W. Schnepf, 73, passed from this life on October 3, 2012 in Scottsdale, AZ. He was born to Jack and Maude Schnepf in Mesa, Arizona on January 31, 1939. He was the youngest of seven children. He came from a family of Queen Creek, AZ pioneers, having lived and farmed there since the 1940s. He attended elementary school in Queen Creek, graduated from Chandler High School in 1957 and went on to attend Brigham Young University. In 1958, he married the love of his life, Margaret Ann Ellsworth. He was blessed with and is survived by his five children, Brad (Wendy) Schnepf, Russell Schnepf (Ed Hall), Deann (Jay) Peck, Matt (Mary) Schnepf and Mikel Ann (Bob) Hansen. He is also survived by 16 grandchildren: Christina (Brett) Bradshaw, Ryan Schnepf, Brittany Naylor, Samantha Peck, Nicole Peck, Nate Knight, Nonnie Knight, Nick Knight, Natalie Knight, Riley Schnepf, Taylor Schnepf, Emily Kindall, Joshua Hansen, Jake Hansen, McKenna Hansen and Sam Hansen and two great-grandchildren, Ava and Audrey Bradshaw. He is also survived by his two brothers Max Schnepf and Don Schnepf and by brother-in-law Bob Kanaga, as well as a large extended family. He was preceded in death by his mother and father, brothers Ray, Dale and Jack and his sister Maudene Kanaga. His family was his first priority and his biggest joy in life. Darel worked as a farmer and a real estate developer, and he owned and operated H2O, Inc., a domestic water company in Queen Creek, AZ. He loved people and he never knew a stranger. He was a big man with a big heart and was very generous. A viewing will be held Sunday, October 7, 2012 from 5:00-7:00 PM at Bunker’s Garden Chapel, 33 N. Centennial Way, Mesa, AZ. Funeral services will be held on Monday, October 8, 2012 at 10:00 AM, with visitation at 9:00 AM, at the LDS Stake Center located at 2559 E. Combs Rd. In Queen Creek (cross streets are Combs Rd. and Schnepf Rd.) Internment at the City of Mesa Cemetery.